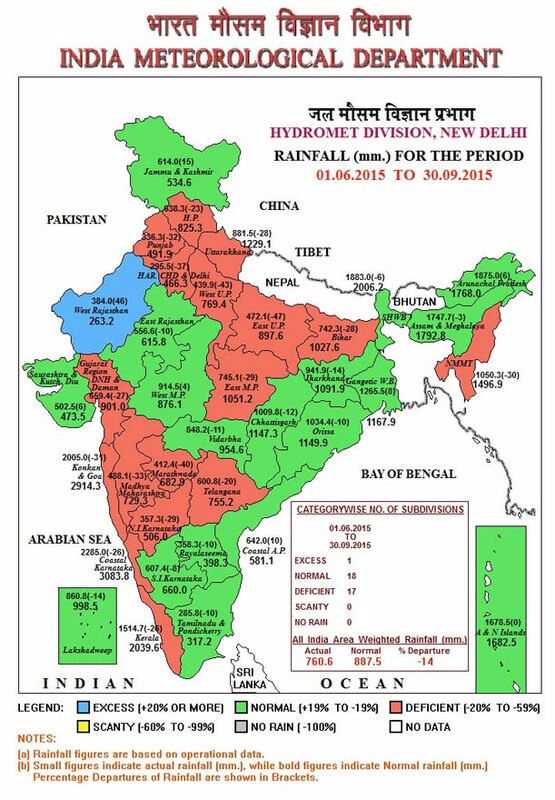 Almost half (17 out of 36) of India’s meteorological sub-divisions have witnessed deficient rainfall this monsoon. But there has also been a paradox this year. The country’s driest division, west Rajasthan, has received excess rainfall. This year, India received 14 per cent deficient rainfall in June-September season as we officially bid a formal farewell to the rainy season. According to experts, the El-Nino phenomenon, which occurs due to abnormal heating of the western tropical Pacific Ocean, was responsible for rainfall scarcity. Last year, India had witnessed 12 per cent deficient rainfall, thus giving rise to a drought-like situation in the most part of the country. Uttar Pradesh, Bihar, Mahrashtra, Karnataka, Punjab, eastern Madhya Pradesh, Haryana, Telangana and Konkan region of the country witnessed deficient rainfall ranging from 47 per cent in Uttar Pradesh to 20 per cent in Telangana this year. Ironically, western Rajasthan received nearly 50 per cent of excess rainfall. Uttar Pradesh, Bihar, Maharashtra and North Karnataka were most affected by deficient rainfall. In Uttar Pradesh, the eastern part received almost half of normal rainfall. This region witnessed the highest amount of deficit rainfall in the country. Last year’s drought, coupled with vagaries of weather during the Rabi season, has hit hard India’s total foodgrain stock, which has reduced by more than 5 million tonnes. This year again, the food stock may be affected as those states, which contribute more to grain production, have witnessed deficient rainfall. Uttar Pradesh contributes more than 20 per cent to the country’s food grain production. Last year, the state declared 44 districts as drought- prone area whereas this year again more than 54 districts have received scanty rainfall. Production of pulses will also be affected, as Maharashtra, Madhya Pradesh and Uttar Pradesh are reeling under rainfall deficit. More than 50 per cent of wheat-producing areas will be affected by rainfall deficit and this includes Haryana, Punjab and Uttar Pradesh. Monsoon is the planet's most complex weather system, which makes its prediction difficult. So, since the launch of Monsoon Mission in 2012, our objective has been to improve the prediction systems so that we can consistently provide reliable monsoon forecasts. And we have fairly succeeded in it. Until recently we had very poor predictive ability. Now, with the influx of technologies for observations and measurements of meteorological parameters, we have a much better sense of present conditions, which is essential for future predictions. We have enhanced the resolution of satellite images by reducing their grid sizes from the standard 100 km2 to 38 km2 , keeping in mind the sensitivity and variability of the Indian monsoon. This helps us observe local factors, such as cloud cover, in a much more accurate fashion. Advances in numerical modelling of monsoon have also greatly helped us improve predictability. Soon we will be able to set up a real-time monsoon prediction system. However, unlike several developed countries, India does not have a weather prediction model of its own. We use an American model, ncep cfs v2.0, developed by the US National Oceanic and Atmospheric Administration (noaa). To make it suitable for predicting the monsoon, we are reworking some of its parts by feeding in our observations and calculations. We ran the model in January this year. After running it 40 times, we released our monsoon predictions in February, months before other agencies could. We also reforecasted monsoon incidences between 1982 and 2008 to evaluate efficiency of the model, and I can confidently say that we have created the world’s most successful model to predict the monsoon. We are still improvising it and shall complete the work by early next year. After that, we are planning for a second Monsoon Mission, under which our focus would be to effectively communicate and disseminate information to common people. The Centre for Climate Change Research (cccr) was established by the Union Ministry of Earth Sciences (moes) in 2009 with an aim to improve the skill and capacity of scientists in the country so that they can address scientific issues pertaining to climate change. For this, our team of 30 scientists has adopted a two-pronged strategy: one, to improve capacity in areas of modelling, and two, to expand the scope of observations. To improve modelling, we have been studying long-term changes in climate at the global and regional levels, and short-term changes at the regional level. For better observations, we are improving scientists' capacity in the field of palaeoclimatology (study of climate patterns since ancient times), atmospheric chemistry and the impact of climate change on different ecosystems. So far, we have had two major achievements. One, we have developed the Earth System Model (esm), a high-resolution climate model that can better describe the impact of climate change on weather patterns globally and on the South Asian Monsoon in particular. It was recently published in Bulletin of the American Meteorological Society. We have also improved NCEP CFS v2.0, the model used for monsoon prediction. Now we have better data related to ocean physics, especially pertaining to monsoons, for the model. We hope that both these models would be used in preparing the next Intergovernmental Panel on Climate Change Assessment Report IPCC AR6). CCCR has also been able to ascertain reasons for the observed decline in monsoon rainfall. Using high-resolution models, we have found that the trend is largely due to anthropogenic factors through land use changes and aerosol emissions. True to the India Meteorological Department’s (IMD) prediction, this year the monsoon was as bad as last year. According to the IMD press release on August 26, 2015, the cumulative rainfall received by the country starting June 1-August 26 was 12 per cent below the long period average, which is 89 cm (1951-2000). The situation did not improve in September and with monsoon on its way out, India will witness a dry phase in the coming months. Poor rainfall has reduced the water level in major reservoirs and this is something to worry about. The water stored in dams is mainly used for irrigation and power generation, but in some places drinking water is also supplied from reservoirs. The Central Water Commission (CWC), a technical wing of the Ministry of Water Resources, River Development and Ganga Rejuvenation, is monitoring the live storage status of 91 reservoirs across the country on a weekly basis. The result of the monitoring from April till September has been uploaded on the CWC’s website. The “live storage” of a reservoir is defined as the portion of the reservoir water that can be used for controlling flood, power production, navigation and downstream releases. Forty one per cent of these 91 reservoirs have hydropower benefit with an installed capacity of more than 60 megawatt (MW). 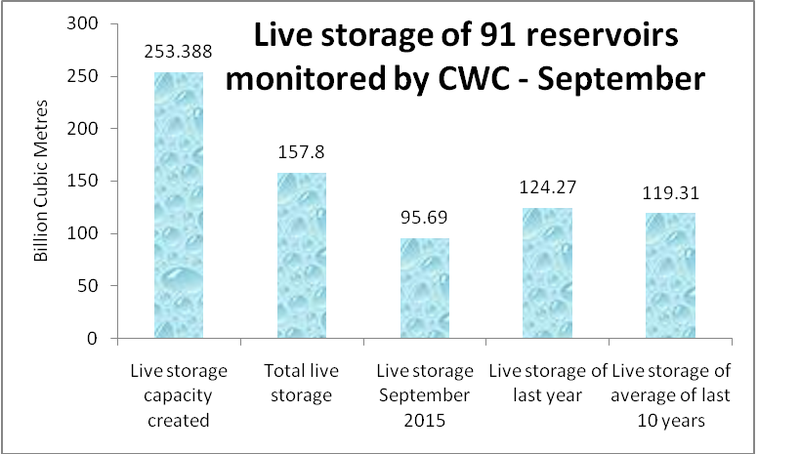 The analysis of the current live storage in September end (September end) says that the reservoirs show a dip of 23 per cent from last year (September 2014) and around the same percent when compared to the last 10 years’ average (data compared during the same time period). When observed state-wise the drop in the reservoirs in different states can be well understood. 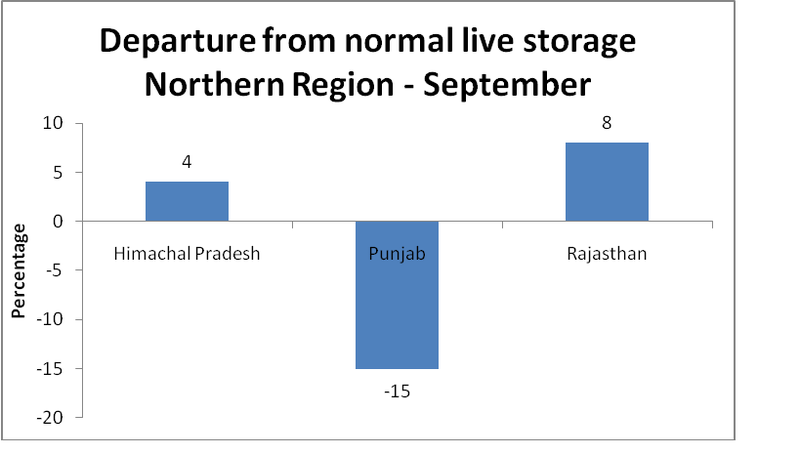 Punjab, Jharkhand, West Bengal, Gujarat, Uttar Pradesh, Maharashtra, Odisha, Chattisgarh and all the southern states show live storage of the reservoirs far below the normal live storage. The report of September end as published by the CWC, shows a poor figure as far as reservoir depths go. The maximum number of reservoirs are in the southern region which is around 31 and out of these, 13 have been filled up to 40 per cent or below when compared to the full reservoir level (FRL) and six have been filled up to 41-50 per cent FRL. The western region (consisting of Gujarat and Maharshtra) is next to the southern region in terms of the number of reservoirs, which is 27. Seven of the reservoirs are filled up to 40 per cent or below compared to FRL. None of the reservoirs in the northern and southern regions are filled up to 100 per cent (coinciding with FRL). The central region consisting of Madhya Pradeh, Uttar Pradesh, Chhattigarh and Uttarakhand also have poorly filled up reservoirs. 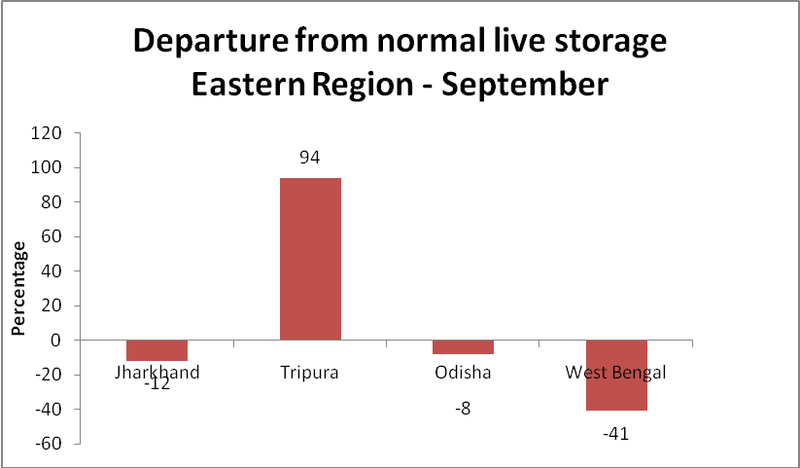 Gujarat, West Bengal, Punjab and Jharkhand have reservoirs which have drastically deviated from normal storage when compared to August 2015. 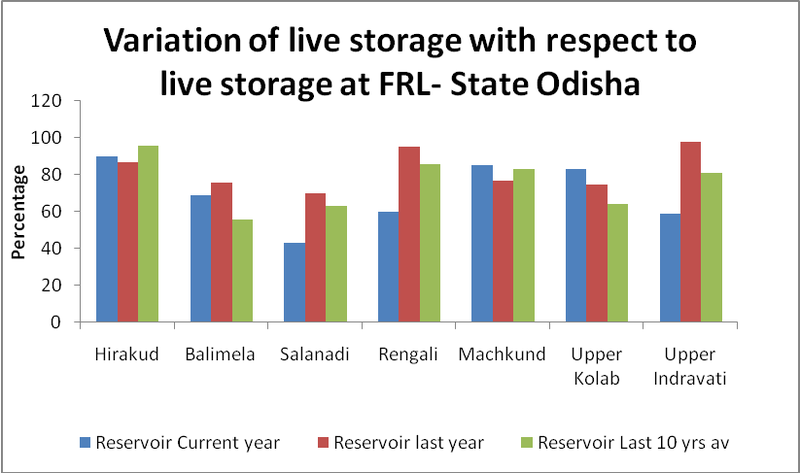 The data from Odisha shows that the current year live storage in different reservoirs have crossed the 10-year average live storage only for two reservoirs. The difference of these two values are quite distinct in 71 per cent of the reservoirs pointing that the situation is far below the normal. 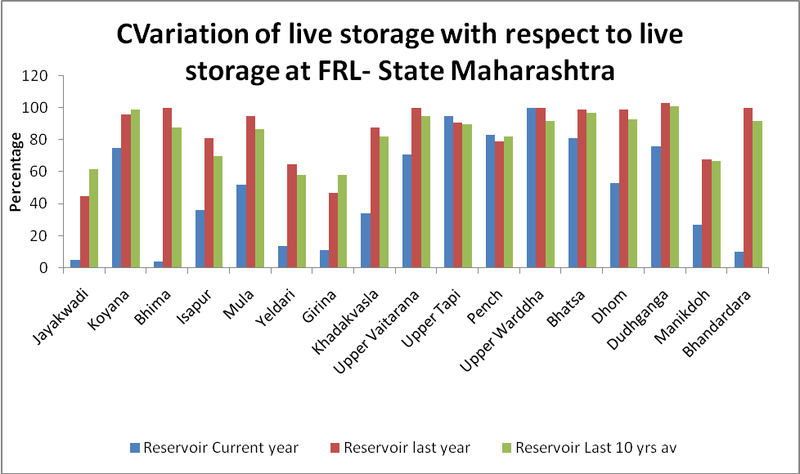 Maharashtra has almost 17 reservoirs in the state and only three show current year live storage towering over the 10 years’ average live storage. Otherwise, 82 per cent of these reservoirs are in a bad shape. 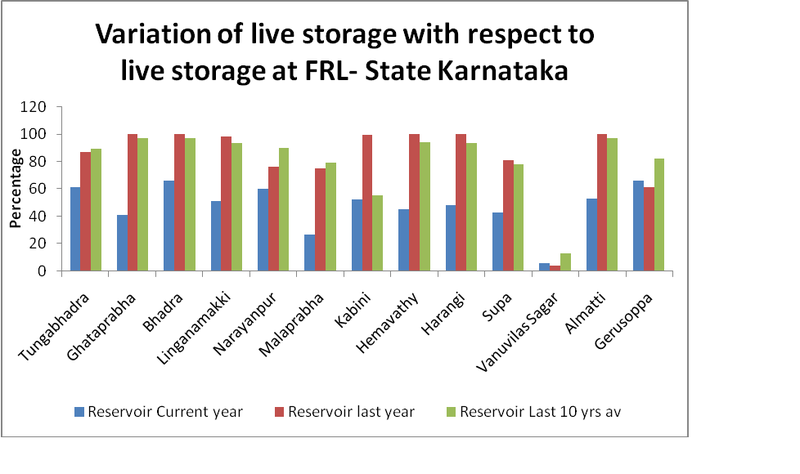 Karnataka shows that the current year leve storage was never above the last 10 years’ average live storage. 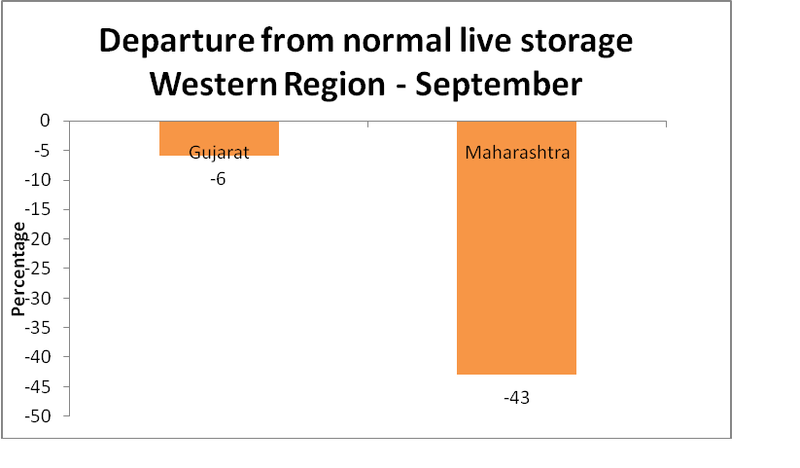 Overall analysis of the state of reservoirs shows that there has been constant lowering of the water level in the reservoirs, especially in the drought-hit states. A debate opens up whether the states should also invest in decentralised water systems, invest in traditional water management systems as a supplementary source, at least for irrigation and drinking water security. The nation needs to think on this. The declining levels in reservoirs has also reduced the power generation capacity in several states. Koyna in Maharashtra has the largest production capacity (table). All the states which have major hydroelectric power (see table) show a signicant deviation from the normal storage for their reservoirs as per the latest survey report of the CWC. As per the Odisha Hydropower Corporation Limited on October 1, 2015 the power generation came down to 677.26 MW. Media reports say that the state used to generate 1,000 MW during the normal hours in a day. Maharashtra also faced a deficit of 500 MW per day according to the government, media reports say. According to these reports the deficit was as high as 1,500 MW as per the experts. This year’s rainfall deficit may be the highest in the past five years, but India has seen consecutive monsoon deficit percentage touching double digit (14 per cent in 2015) after 50 years. India first witnessed a drought-like situation after Independence in 1951. It affected 34 per cent of the country’s area. Severe drought year of independent India was of 1972 when it impacted 40 per cent of the country’s area. “It was one of the reasons behind (the) political turmoil made way out of Prime minister Indira Gandhi,” says Chandra Bhushan, deputy director feneral of Center For Science and Environment, a New Delhi-based non-profit. “The drought of 1972 and 1974 made the ground to unite the Opposition against (the) then political regime” he adds. This time, states have learnt their lessons well from the past and were prepared for drought before the formal announcement of the departure of monsoon. Karnataka, Chhattisgarh and Maharashtra announced drought when the monsoon started retreating. Karnataka was the first state which declared drought and sought Rs 3,000 crore as compensation. Chhattisgarh declared 93 tehsils/blocks as drought-prone. Maharashtra planned to levy tax on petrol and diesel, liquor, cigarette, and gold and diamond jewellery to collect money up to Rs 1,600 in the next five months for drought mitigation. It is to be noted that Maharashtra also put famine tax in 1972 which still continue today. After a cabinet meeting, state’s finance minister Sudhir Mungantiwar said to impose a surcharge of Rs 2 on petrol and diesel, value added tax on liquor, cigarettes and beverages have been raised by 5 per cent and VAT for gold and diamond jewellery would be 1.20 per cent.